Hard Vacuum spaceships combat board game . Hard Vacuum is a tactical game of WWII space combat in a world that should have been. 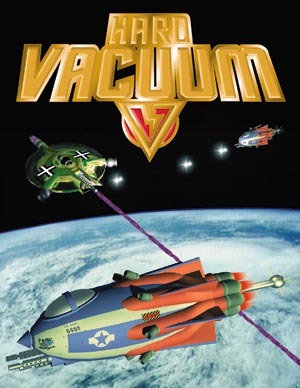 The Hard Vacuum rulebook is a complete game, just add dice. U.S. Army Space Corp and German Raummacht fight each other for the control of Earth orbits and routes towards moon. A simple game for teaching vectors! Yeah! And you get to shoot down Space Nazis. What could be better? Fun game with clever mechanics. My favorite in the tactical space combat genre. Actually feels as much like space as naval combat, which is somewhat unique in this genre.